In support and in partnership with the Quezon City Film Commission, the Film Development Council of the Philippines is conducting the Film Industry Conference and the Film Producers' Workshop Series this October 20-22, 2017 at Novotel Araneta Center, Quezon City. 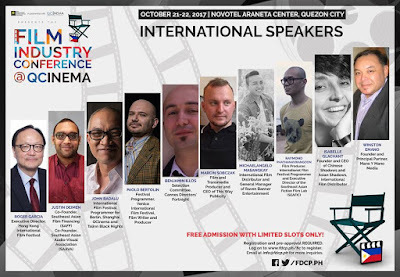 Bringing together big names from the international and local film industries, the Conference and Workshops will feature topics on international film production, distribution, and marketing of Filipino films. 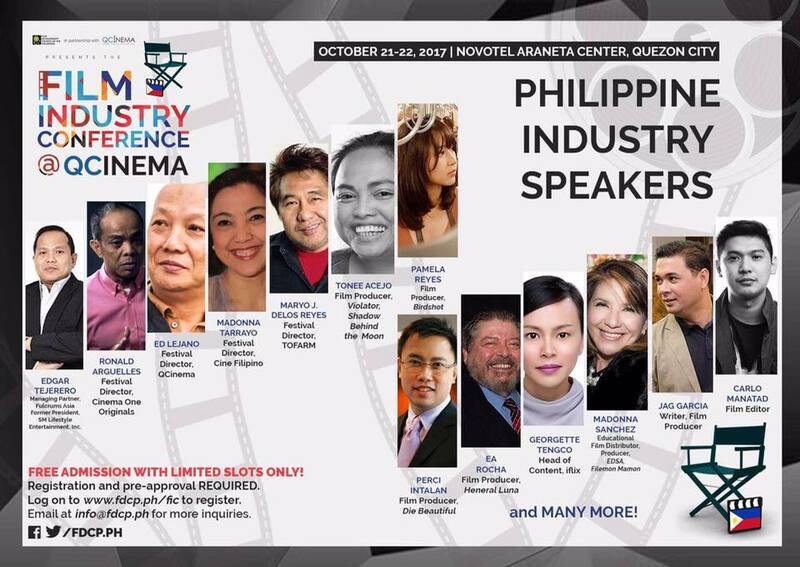 “These events are especially aimed for film industry leaders and filmmakers already immersed in the industry so they may be able to update, challenge, and innovate their perspectives on the current trend of both local and global cinema,” said FDCP Chairperson and CEO Liza Diño. 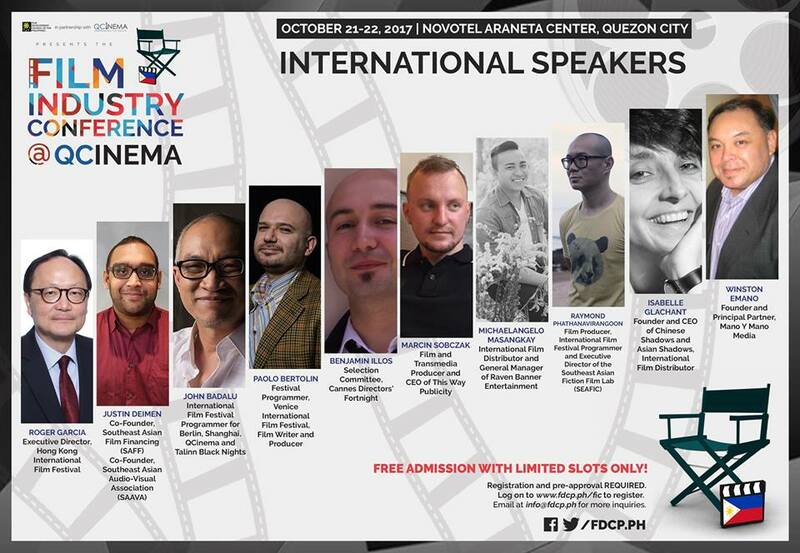 “These will also be the platforms to thoroughly explore new ideas and concepts on how Filipino films and content can reach a wider market based on the best practices and innovations of other foreign countries,” she added. 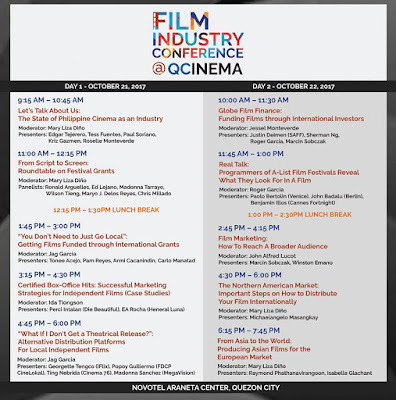 Featuring international film festival programmers from Cannes, Venice, and Shanghai international film festivals, distributors, and marketing experts, the FIC on October 21-22, 2017 will be touching on the essential aspects of the industry, from producing, to marketing, and distributing films to both local and international markets. 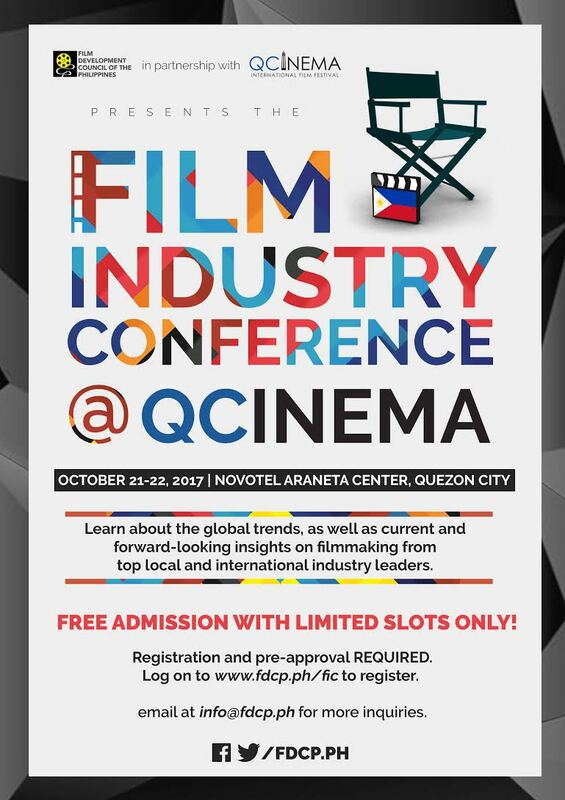 The FIC is free admission with limited slots only and will require pre-selection of participants through http://www.fdcp.ph/fic. The Film Producers' Workshop Series on October 20-22 will have workshops aimed at young filmmakers with projects in development who will be able to consult and network with international speakers on the aspects of production and distribution. Registration for each paid workshop opens October 6, 2017 (Friday) at www.fdcp.ph for a limited time only. 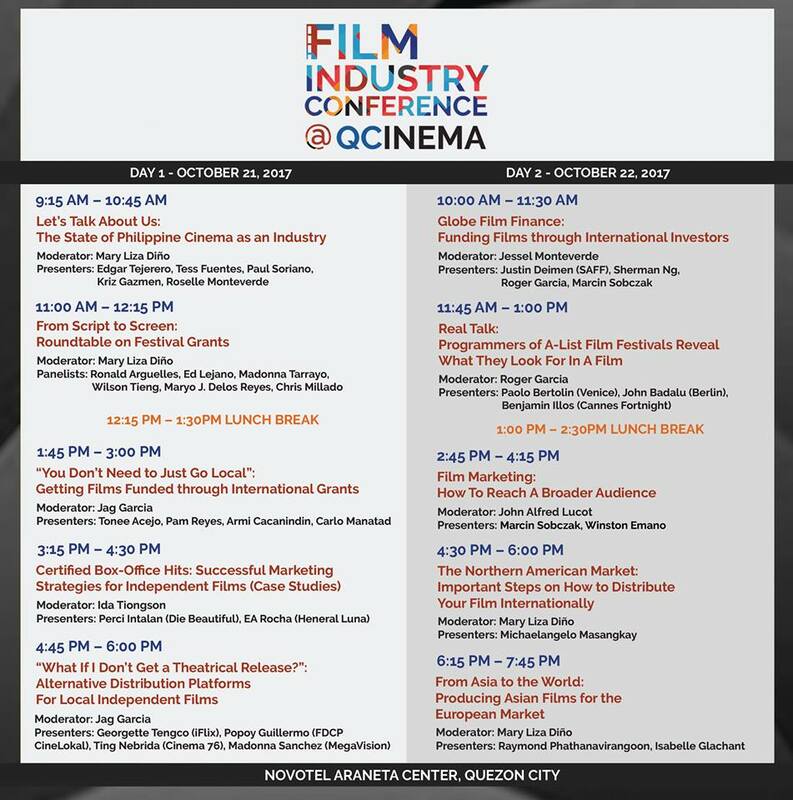 Another highlight of the FDCP-sponsored events is the Rainbow QCinema which FDCP programmed with LGBTQ-oriented content and filmmakers. A Block Party in honor of this will be on October 21, 2017, 7 PM at Manhattan Strip, General Malvar Street, Quezon City. This will be a culmination of the LGBTQ Community and a celebration of their colorful and meaningful contributions not just to the film industry but to society. For more information, visit the official FDCP Facebook page or email at info@fdcp.ph.